Hi Friends: I'm so excited to share that I'm joining the SheepSki Designs Challenges blog design team which goes live the beginning of April. Here's my introductory project, using the Wild Roses digital image from SheepSki Designs. 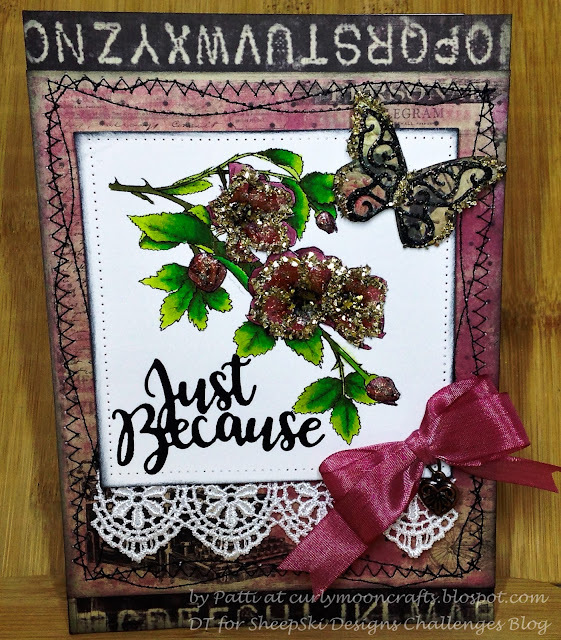 Hope you enjoy the card - be sure to join us for this new challenge blog in April. You can also join in the fun with the challenges in the SheepSki Designs Digital Stamps Facebook group. Have a great Monday! Print image twice onto smooth white cardstock and color with Spectrum Noir markers - color just the large roses in the second image and fussy cut them. Shape the flowers with flower shaping tools. Die cut the focal image with a stitched square die. Cut the background papers to fit an A7 card base and stitch the center panel on the sewing machine to add texture. Center the focal image on the card using craft foam for dimension. Add lace under the focal panel. Glue the shaped flowers to the card for dimension on the focal image. 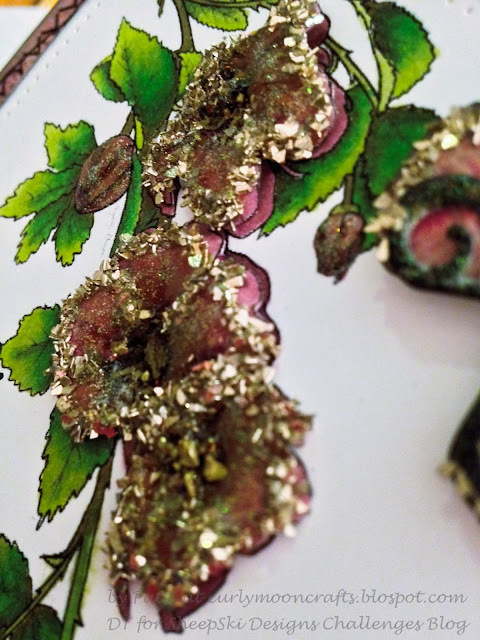 Add glossy accents and ultra-fine glitter to all of the roses, then add glass glitter to the edges and Earth Elements to the centers of the shaped flowers. Cut 2 butterfly dies from the patterned papers, glue them together, add black glitter pen to the smaller butterfly, then add glass glitter to the edges of the wings and the body. Use foam square to adhere the butterfly. Cut the sentiment from black cardstock and adhere to the focal panel. Die ribbon with the dark pink marker, tie into a double bow, add charm, and add to card.